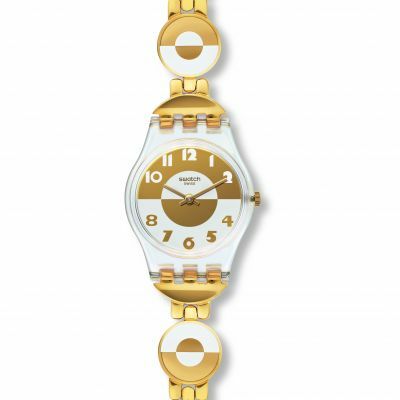 A ladies monotone Swatch watch, with basic time functions and swiss quartz movement. For those who want a quality watch without all the flash, the LB153 is the ideal choice. Perfect watch, bought it as a gift and the person loved it! Great service and fast delivery. Lovely watch, clear display, comfortable on the wrist without looking overpowering. Arrived very quickly, excellent service. The watch was exactly what I expected. In spite of other reviews I have no problem with the size of the strap. It fits perfectly on one of the central holes. Arived on time in first class condition well packed, what more can you ask. the battery cover is metal otherwise the watch seems very good. Really like this watch. It is extremely light on my wrist and has a clear easy to read face. Would buy again. I bought this watch for my 11 year with a view to making her more time conscious. I needed something that had all the numbers on the dial and also stylish as she is very fashion conscious. Needless to say this fit the bill, she loves it and cant believe how comfortable it is. Were still working on timelines but we are now on the road to success. V happy with my first ever Swatch. Chose plain black one for everyday wear.it looks neat and feels comfy. Good time keeper with clear face. Fantastic little wrist watch - very universal and classy. Simple design goes well with everyday outfits such as jeans and tshirt but also suitable for more formal dress code. 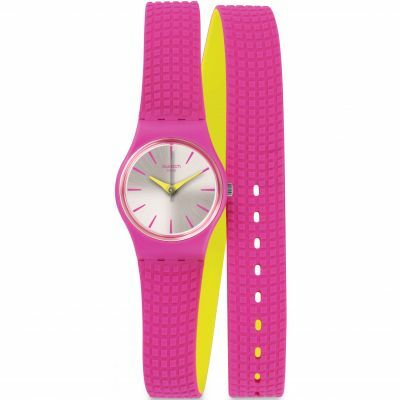 Perfect for slim wristers who struggle to find a good fitting watch. It is water resistant and it has glow in the dark handles and a bonus of glow in the dark hour-dots. Very helpful especially when you wake up in the middle of the night desperate to know what time it is and you do not want to put your light on : I rarely take my watch off so all those features are super helpful - I swimm, wash up, shower, do my pottery and sleep in my easy to maitain watch. 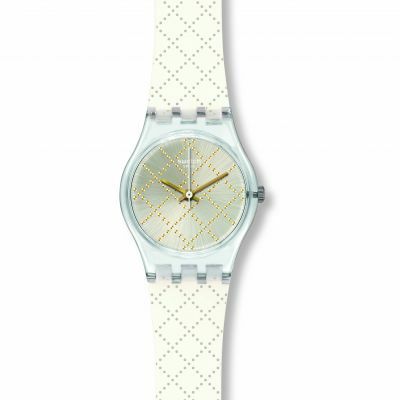 you definitely get much more than you pay for with this awesome Swatch. This watch is brilliant - very clear face good for those with poor sight- copes with water from washing up, gardening, etc. comfortable to wear, and can be read surreptitiously in meetings. A cosy and light casual watch. Excellent for women with small wrist. My sister is very happy with the watch which I ordered on her behalf. This watch is perfect for me.The face is easy to read and it is comfortable to wear. I also think it adds a touch of class to my wrist. The watch I bought is pefect in every way! I am delighted that it looks so good, so well made, and, importantly, it keeps accurate time! This is the second watch from this company, both of a really high standard, my wife loves the look if hers, and being the first digitall watch she has owned, is pleaed with every aspect of it. Thanks, Watch Shop! Very smart inexpensive compact every day reliable watch. My 3rd. The perfect watch that I have been looking for sa long time. So pleased with it in every way. Great looking ladies watch - bought as a present for my daughter who is a dogwalker and she needed a hardwearing sensible time piece to wear for work. Actually looks very stylish and smart, I would wear it myself. I am delighted with my Swatch watch, this is the 3rd one I have had. Just what I wanted - no metal to react to. Very comfortable to wear. Excellent service and delivery. 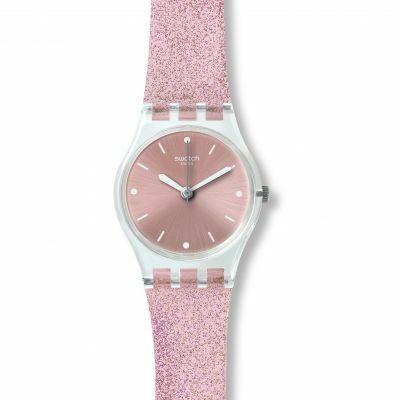 Love my Swatch Something New Watch. Its so resilient, ideal for sports especially swimming, gardening etc. Great deal again I keep returning and telling people about this site. Its the new fresh way to buy a watch. In fact, I did a review shortly after the watch was recieved. I dont have a copy, so will do another short one. My wife had a Swatch for many years, which she wore on other than formal occasions - it was very reliable, so I purchased the current similar moel. The fairly small size suits her, it is neat, easy to read and I am sure will give her many years of good service. I have these watches all the time it is not the first time i have brought one.I find them great for everyday use and will keep it on all the time. A good looking everyday watch. Just the right size and easy to read. I do have a very small wrist and for some reason it has slipped round a couple of times. I could tighten the strap but I find that uncomfortable so slipping is a minor inconvenience. Good value for money and would certainly recommend. Wonderful watch, exactly what I need for my work, taking milk samples from milking cows in the parlour, strong and waterproof. Excellent service - Just a couple of days to wait! My wife i9s very pleased with her watch, which is a pleasant design and easy to read. Such a useful, practical watch that can get wet, and is luminous in the dark! The strap is light-weight and comfortable, and the clock face is small. This is a good choice for a person who doesnt like wearing a watch. My wife is a practice nurse and I wanted to buy her a simple easy to see, clean watch with a second hand. This watch lives up to expectations. Sometimes fancy watches are a little hard to read and inappropriate in a health centre environment. This watch is perfect. The watch was a birthday present for my wife and was exactly what I wanted. Some reviews mentioned that the strap was a bit short but we found it to be the perfect size for my wifes wrist. The face is clear and uncluttered and the time can be seen in the dark with the fluorescent hands. I suspect my wife will be wearing the watch for many years to come. Attractive watch and really good size face for my slim wrist. I have been looking for a stylish watch with a non leather strap for ages. Very pleased. This was bought as a gift for my mum and I thought that it was too small so I have returned it and ordered the mens version which is much better. Even if Id have bought it for myself, I think I would have thought it was too small. An excellent and practical watch. Clear, easy to read dial and a smart, practical, combination strap.. I bought this watch for my mother, who wanted something clear and easy to read but was still stylish and this fits the bill. The luminous hands make it easy to read the time in low light and the white face looks good against the black strap. The strap is comfortable to wear and easy to adjust and is not too thick like some rubber straps. The battery can be replaced by unscrewing a simple screw on the back..easy for anyone to do without an expensive trip to the jewellers. Bought this watch for myself. Needed a watch with a clear face that I can see without having to put my glasses on to see the time. This watch is perfect. Also a good price for a every day watch. Far smaller than it looked in the picture, does not sit well on my wrist and feels quite flimsy. On plus side very clear to read dial. Loved the watch, slim neat very practical for every day use, but stylish classic to ware with anything. 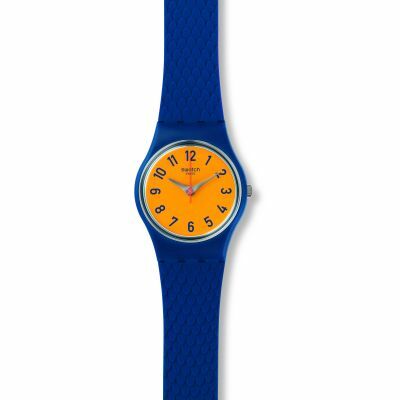 My wife has been wearing this model of Swatch for as long as I can remember and being in the catering business it certainly takes some punishment.She never ever takes it off and despite being a keen swimmer in her free time, never has a problem. This is only the second one in over twenty years and the only reason for this is that she damaged the strap beyond repair on her old one.A great watch at a bargain price .What more can you wish for? Its worth a lot more than £32 but I am definitely not complaining. I purchased this watch as a gift for my mum, and its absolutely perfect! Nice large watch face, and simple black plastic strap makes this an ideal watch for everyday use. As the watch is waterproof you dont need to take it off if your washing up or doing anything else around the house. Swatch watches never change, the plastic just gives out around the battery holder after about 6 years. Think this is. The third Ive had like this and Ill be buying another when this bites the dust. 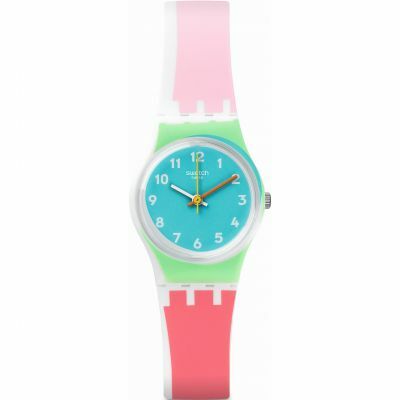 I love swatch watches! I have worn them for years. watch arrived quickly and I was kept informed of delivery. They are robust and I dont have to be careful with them. I feel they are worth the extra money as opposed buying a Casio which are ok but the retaining straps on the wrist bands tend to go. I wish they did plain ones in other colours beige/natural. Great value, practical watch. 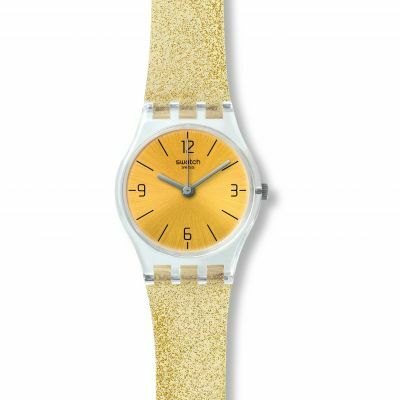 Im allergic to base metals so this Swatch model is really good, and I dont need to take it off when I shower, swim or do the washing up. This is the fourth one I have purchased over a period of 30+ years my puppy chewed one when I took it off to go into hospital, and I lent one to my sister for a holiday and she never gave it back! so I can highly recommend it! 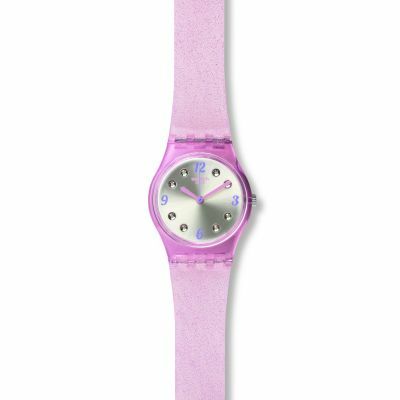 Very comfortable and stylish watch for a woman with a small wrist or for a child. It is a little smaller than I thought it would be but still fits nicely on my wrist with a few holes on the strap to spare. Excellent quick service. Good value for money. Was exactly the watch I was looking for. can not find them in many shops. 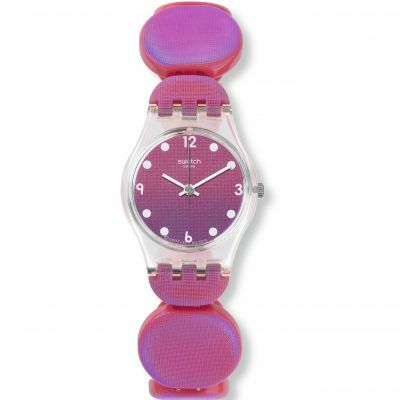 As usual a Swatch Watch is good value for money. A reliable name and that extra bit of quality. This was a gift for my Mum, she wanted an easy to read face and good time keeping, so Swatch ticked both boxes. a replacement for my last swatch. Simple efficient and luminates in the dark without having to press a button.Great when up for children in the night. Strap quite short. Great watch, small and neat, suitable for busy outdoor lifestyle. Plastic strap suitable for allergy/eczema sufferers. the watch is a perfect gift for my daughter who is going travelling.Nice size for anyone not used to wearing a watch. Very clear faced watch. Great as hypo alergenic so fit for everyone. 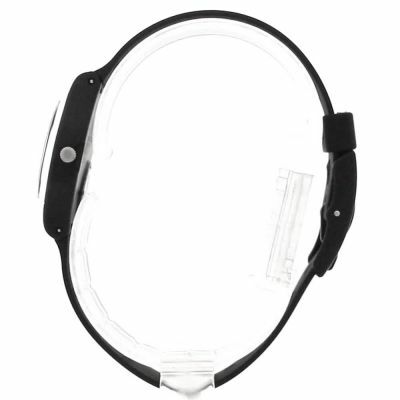 Ideal as ladies watch as smaller face and strap. quick delivery; correct item; fine! Great quality with a simple easy to read face and an affordable price tag. A must buy! It's kept good time not lost a second well worth the money I'm very pleased. Great item, quickly delivered. Hassle- free experience! Watch is exactly as described. This watch was to replace one of the same, that we'd had for many years. It has a nice clear face, that can be seen without putting the glasses on. I am amazed at the speed at which I recieved my puchase. Ordered onTueday Pm 22-11-11. Recieved the following morning. As this is a present for my wife for Xmas I didn't expect to get it so quickly,well done!!! The watch is a gift for mydaughter. It looks stylish, but also a bit classy. It should suit her age group and lifestyle. GREAT SERVICE AND A GREAT PRICE WOULD DEF USE THIS SERVICE IN THE FUTURE. CHEERS. The watch is great, numerals easy to see especially as it is for my mother whose eyesight is deteriorating - a good Christmas gift! Great watch as was exactly what was wanted. Was bought as present to the same swatch as has been worn since the 90s! This is the perfect watch for me. Small clear face, waterproof and simply understated. It has to be rugged enough to cope with fieldwork in all weathers but still be wearable for most occasions. Additionally, I am allergic to metal and this watch has a plastic back and strap which means no itchy wrist. My only problem is that Swatch keeps making the watch strap shorter! I'm now on my third copy of this model and had to take the strap off my previous copy of this watch to use on my new one. The difference in length isn't much, but enough to make it virtually impossible to do up single-handed and I don't have fat wrists. 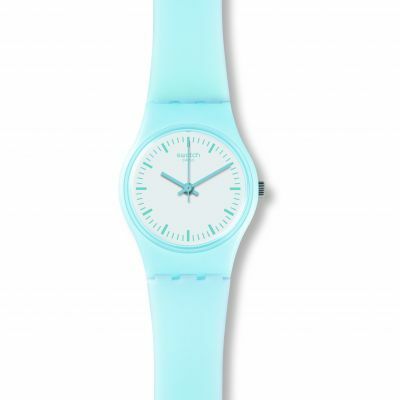 I'm not the only one reviewer who has commented on the ridiculously short strap and hope that Swatch start listening. This is the only downside to this otherwise perfect watch. Ladies Swatch Something New watch LB153 arrived in excellent condition and the delivery was so quick! I have a small wrist and the black plastic strap fitted great! So comfortable too! Thinking of buying one in another colour. !! This is a great watch if you just want a lightweight, classic (but well-made and reliable) ladies watch. I have small wrists so wanted a watch with a small face, which this has (about 23mm across). The maximum wrist size for this strap would be about 18cm and then you'd be on the last hole so it's not worth getting if you've got largish wrists. I like the analogue design, and the white face and black numerals mean that it's very easy to check the time. The rubber strap is comfortable - I don't like metal bracelet-type watches and am allergic to leather, so it had to be a synthetic strap anyway. The only thing missing is a day/date display, but this is probably because the watch face is so small. Other than this, it's the perfect watch as far as I'm concerned. The watch fits comfortably on my wrist and it has a smooth surface so it doesn't tend to get snagged on anything. It has a robust water resistant design well suited to my outdoor job so I don't have to worry if my watch gets wet or dirty. I like the black numbers on the white face as it makes it really easy to read the watch even in semi darkness. I chose this watch as a gift- I thought it looked practical and was clear and easy to tell the time. I bought this watch as a replacement for an identical watch I'd had for four years, so I knew I was going to like it. It's got a small face, ideal for my skinny wrists, and the strap goes small enough too. The second hand is useful, as are the luminous dots on the hands and the hour markers. 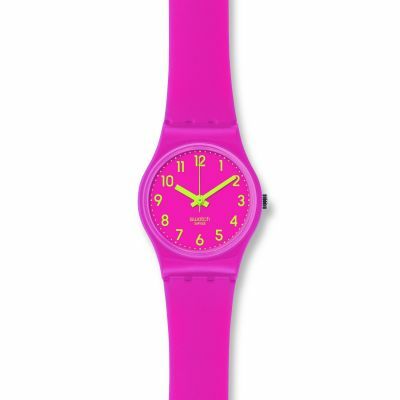 It's cheap and cheerful, ideal for a watch worn to work where it is likely to be damaged or lost, but equally suitable for everyday and slightly more glammed-up wear. Great little watch that I can where all the time cos I forget to take it off when I shower or go swimming. The price and the quick delivery was amazing I will definately order a watch from this company again. 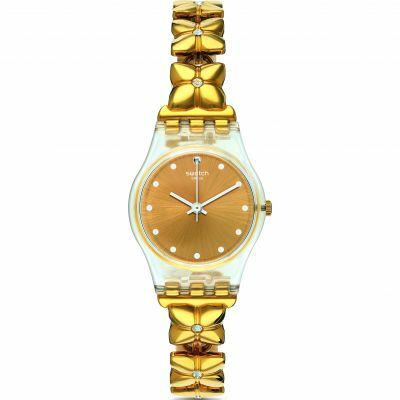 Great ladies watch with clear, easy to read dial. 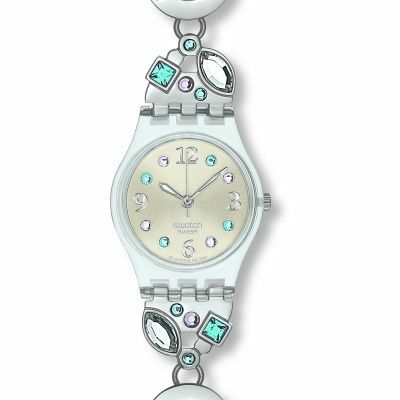 Simple, unfussy styling with comfortable strap which stays put even on a slim wrist. I was also pleased to find that the strap could be replaced if necessary,rather than being moulded to the dial casing. It's great for wearing all day at work - the main reason for my purchase. The second hand and luminous hour/minute hands are also a bonus on such a reasonably priced watch. Great quality and very good value for money. I bought this watch some years ago, and wear it constantly, it's never off my wrist. The strap finally broke a couple of weeks ago, and just to let H Jackson know you can indeed replace the straps, my local jeweler did it for me in a matter of minutes. 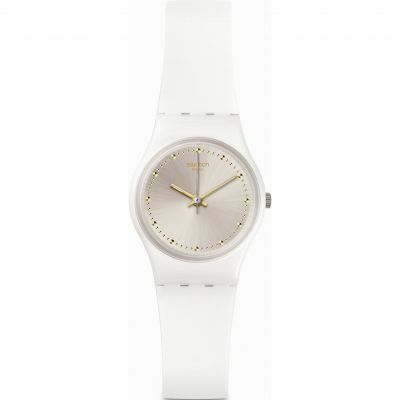 A really good choice if you just want a plain watch that would go with almost anything. It's just a white face with black plastic straps. Although, I bought this one to replace my last watch (same model) - the mechanism is still ticking away happily but the strap snapped after a couple of years. A friend of mine buys the same model in the men's size and he finds the straps do not last long. It is a shame that the straps can't be individually replaced. A simple watch that is exactly what I wanted for my daughter - easy to read and glows in the dark. What more can I say! 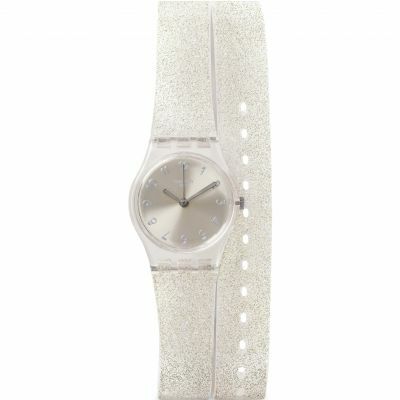 - this small neat watch is perfect - clear dial, comfy strap,easy to fasten and perfect timekeeping. A perfect watch in all respects - to say nothing of a reasonable price and extremely efficient delivery. Just what I have been looking for. A practical watch, easy to read and will match anything. Good service wit next dat delivery and gurantee.